Our story starts in a city in the rainy, mountainous northwest corner of a continent. Not Bergen, but Seattle. Actually, of course, the story begins in France, and it begins in 1982 when writer Philip Wohlstetter, the godfather of Invisible Seattle, buys an apartment in France because of the strong dollar, spends a year there, and comes back to join our small group of Seattle writers with lots of fresh information from a year’s worth of reading and living in Paris and seeing things. Among his finds were a collection of books by the Oulipo and an account a high-tech installation piece by French artist Fred Forest, called the “La Bourse de l’imaginaire” (‘The Stock Exchange of the Imaginary’), which purported to give running real time figures on citizens’ moods and dreams across the city. We were particularly excited by the Oulipo’s ideas about constraints, text manipulation and remixing, which seemed much more interesting to us than the then better known (in America) scissors-and-tape cut-up experiments of William Burroughs and Brion Gysin. From these seeds, and other inspirations including Dada and Surrealism, collaborative writing experiments and political street theater, grew a project that was based on the fusion of two ideas. The first idea was that there was no great novel of Seattle. Other cities have a great novel. There was no great novel of Seattle, so the question was: who was going to write it? The second idea was the image of a book-signing ceremony at which everyone who attended had earned the right to sign the book. We decided to devise a way by which the City of Seattle could write a novel—its own great novel—about itself. By the time he got back from Paris, Philip had already established a group, called Invisible Seattle, and along with it a meeting pattern, roughly modeled on what we knew about the Surrealist café meetings. Philip put posters up around the city that said “men of dubious character and fallen women join us on Wednesday nights at the long table in the basement café of Elliott Bay Bookstore,” and it ended with these words that still, to me, represent the spirit of Invisible Seattle: “astonish us!” It was part a very active telephone-pole poster culture in Seattle, and I was one of the people who saw those posters came to join these wacky, imaginative people at the long table. Now the specifics of the long table: it was about 3 or four meters long, and sat 12 or 14 people. The first key to open coffee shop meetings is that they are public (you don’t have to invite strangers to your home). Open house style meetings like the Invisible Seattle Wednesday nights have no formal agenda with a beginning and end. There’s no shame in coming a little late, leaving a little early if you need to, and importantly, you buy your own food and drink, as much or as little as you can afford, so there’s not too much of an economic barrier. If you have the price of a cup of coffee, you’re in. 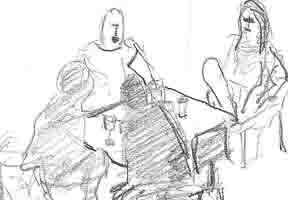 Behaviorally, there began to be a certain dynamic of regulars gravitating toward the center of the table around Philip who usually sat in the center of the table, with his back to the entrance. I think there would have been a different atmosphere had Philip sat at one end of the table, or facing the entrance, both of which are reputed in the business world to be “power seats” in a conference room. We started to notice that newcomers would begin to seat themselves at the outer edges of the table, checking it out, ready to leave if it was weird. And so we in the core group at the center of the table began a little outreach mission to the outer edges of the table. “Hi, I’m Rob. Welcome. What path brought you here tonight?” There was a micro-geographic system established for inviting people toward the center of the table. Why would I talk about spaces, furniture, food, at a literary conference? Because those things are the infrastructure of social and creative relationships, and they are quite literally the equivalent of issues of interface design. They are very important conditions of how people interact. One of the things that happened at the Elliott Bay meetings was that the table could pull people in or it could spin people out. Why would that be? Well, it’s because Philip Wohlstetter, taller than me, bigger shouldered than me, (and I’m quite tall) was an actor and came from a theatre background. And the quickest way to sum it up is to simply inform you that in his senior year at Columbia University in New York, he was in their production of Hamlet and played Hamlet. He’s a man who, when he wants to, can hold a large room spellbound with his voice. Very smart, very articulate—Philip is a quick, engaged East Coast personality in a laid-back West Coast setting. Some of the creative folks who came by were on the shy side. You had to have a little bit of courage or a little bit armor, psychological armor, to kind of stay at the table with Philip. The big table at Elliott Bay Bookstore Café served its purpose of gathering a core group of “literary workers” for the novel project, but as work on the project accelerated in the summer of 1983, a new, less expensive, space was needed to accommodate more frequent gatherings. That space was the living room in my wife’s and my very small attic apartment. It’s an irony of my life: I’m rather tall and I’ve lived, time after time, in spaces that have very low ceilings. In this place the only area big enough to kind of accommodate ten or fifteen—at the height of the project maybe up to 25 people—was this low-ceilinged area under the gables. A person could only stand right in the middle. We called it the Munchkin Palace. We had no furniture really, just mattresses and couch-cushions on the floor—no couch, just the cushions. The first time the Invisibles came over, Philip Wohlstetter, who is taller than me, adopted the following position from which he organized and energized the project: [Rob lies down on the floor of the Landmark with his neck bend radically and his head propped up on the wall.] [Laughter] He spread his long legs out. People had to kind of step over him. And it may seem incidental, but the fact that his head, the origin of this big, smart, authoritative voice was only about a foot or so off the ground, meant that for newcomers, he was a lot less intimidating. And the fact that we were all sprawled out lying on the carpet and stepping over each other was significant. Our body language was casual, intimate really – it was like being in a giant bed – and we were sitting closer to each other the normal comfort boundaries of personal space. This created a bond, psychologically and creatively, in that group. What I like about it is that it was so much like the ancient Greek symposia—συμπίνειν, to drink together—which were lying-down-on-couches drinking-and-talking parties. It’s a recommended body positioning for intellectual exploration. What did we do, reclining together in a small space, trying to figure out how to get a city to write a great novel about itself? We played a lot of writing games. 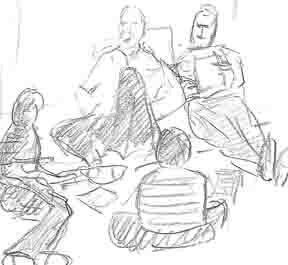 Lying around together in close quarters is an infrastructure that instantly communicates a set of social relationships—non-hierarchical, informal, unguarded. It was so easy to jump into literary games within that infrastructure. The social ice was already broken. I hope you can start to see now that the kinds of things I’m thinking about have to do with how one gets over the shyness factor, how one gets over the creative inhibition factor, and gets into that playful zone where you’re working together productively. Now to neurochemistry: Elliott Bay Café didn’t serve alcohol, and without getting moralistic you can understand how that a caffeine-based infrastructure produces somewhat different conversation than an alcohol-based infrastructure. At the Munchkin palace my wife and I every week would scrape our pennies together and buy a half-gallon of wine and six beers as our contribution. Others brought beer and wine, too, when they could. It worked as a disinhibitor. The content of the writing games got more personal and emotional. The technical skill level of the games probably decreased in proportion. Technical skill seems to me to be more a caffeine effect. As the project started going public in performances that August and the weekend in which were to publically write a first draft approached, the anxiety increased for sure—but I don’t remember any bad arguments, which of course is often another alcohol effect. It is a collaborative effort, too, to keep the group neurochemistry optimized—not too drunk, not too wired. Remember that in ancient Greece, the skill of the symposium host was to regulate the proportion of alcohol to water in the drinks to keep the talkers optimized. The moral of the Munchkin Palace story? Cram people into small spaces to collaborate. Break the personal-space boundaries. The short version of how Invisible Seattle became to be digital in 1983 was that we realized very rapidly that if we were going to entice a city to write a great novel about itself, we’d need to organize the raw data we gathered on some kind of computer. We had uniforms with words stenciled on them, hard hats with a question mark on the front. We’d go out into the streets, and we’d say, “excuse me, we’re building a novel. May we borrow a few of your words?” We got the contents of people’s pockets, what they dreamed about last night, all kinds of things. We started thinking databases and then realized it was a cool angle to call the whole project the Invisible Seattle Literary Computer project. Most people thought the idea was fun. Except for writers. Writers would yell at us on the street: “A computer can’t make literature! You are traitors!” We invited the wonderful sculptor Clair Colquitt to build Scheherazade II, the walk-in word processor that we wrote the first draft inside during the three days of the Bumbershoot Arts Festival. Clair was a hacker sculptor. He would buy the robots from a Chuck E Cheese kids’ pizza place and reprogram them to sing punk songs—twenty-five cents a song. He bought and reprogrammed video games. Coin-operated art. He picked up computers from the dumpsters behind Boeing. Scheherezade II was marvelous—room for three writers inside, a word processor into which we poured handwritten text from the streets and from the audience in the room, and from the printouts of the repurposed video games. Clair was the only one who got paid from that project, and he deserved it. Everything else I’m talking about today was self-funded, out of our own pockets. You work a job; you pay for your art. In the wake of the Novel of Seattle, by Seattleproject Clair offered us the use of his computer bulletin board at night. We said: “What is that?” He said: “I pay for two telephone lines. One is connected to my computer. If your computer calls my computer on the phone you can keyboard messages and, when you hang up, the next person who calls can read what you wrote. You might be interested in writing on this thing.” In the daytime it was his hacker board, dUMMY dATA’s Junk Board. But at night he changed the startup disk for us, and we called it “Invisible Seattle’s Omnia” or “IN.S.OMNIA So in the fall of 1983 we began calling up the system to conduct systematic literary literary experiments. I moved away from Seattle to the Midwest a few months after the completion of the Novel project. It felt like exile. So much of the impetus for the early experiments on IN.S.OMNIA were me being lonely for my old Invisible friends, being far away, and wanting to recreate the fun of lying around the living room and having these writing experiments. That sense of longing, the interpersonal, emotional part was always very important to that project. One of the experiments, along with lots of satire and goofiness, was to see if the computer bulletin board could support sustained discourse. So we read Derrida’s Plato’s Pharmacy together and riffed on it on IN.S.OMNIA. In that same period we had what we called a Derrida Tele-Banquet. The idea was very simple: two identical meals would be prepared, one in Seattle and one in Madison, Wisconsin, where I was living at that time, and served simultaneously with a simple Radio Shack speaker phone sitting on the table that was enough to allow us to have a common meal and a common conversation. Even outside of textuality there was this—the beginnings of a sense of trying to create community through available technology. Another moment of that that is very memorable is a written interview with Harry Mathews of the Oulipo. In the technology of that day when you wrote together online you shared the same screen, the same cursor. It was very easy to intermingle words and even intermingle letters of words. In the very early experiments you’d be at the machine and you wouldn’t know if you were connected yet and you’d type “hi” and the person at the other end would type “ok” and it would produce the word “hoik.” So by the time we had the interview with Harry Mathews, or “interdact” as we called it, “hoik” was the official salutation of interdacting. “Hoik, Harry!” “Hoik, Rob!” This was all with the beautiful old glowing green letters swimming up out of the black screen. When I talked with Derrida later about bulletin board writing, which he had been involved with as part of Jean-François Lyotard’s show at the Pompidou Center, Les Immateriaux, he also had been struck by the light letters on the dark surface as an indication we were now in a truly different writing space. On IN.S.OMNIA we took the name of the fabulously trashy 1950’s horror movie classic, The Creature From the Black Lagoon, and started a room on the system called “Écriturefrom the Black Lagoon” thinking about things emerging out of the black screen, that green text. I don’t know if it’s the same in England, but in America in primary schools there’s a common activity called Show and Tell. Little kids bring an object from home and tell about it in front of the class. So, in the 90s in Chicago I formed a grown-up gathering called the “Persimmons and Myrrh Show and Tell Society.” I would design and mail a flyer every month. It was a formalized form of an activity that we used to call among this group of friends, “culture dump”. It happens all the time at conferences like this. It’s when you meet your culture-savvy friends and simply share every cool thing you’ve seen recently that you think they might like. In Persimmons and Myrrh I had a timer and each person had 13 minutes to show and tell. It worked very well. It was a group of very interesting people who shared, as a social subtext, a horror of wandering, inconsequential chitchat. We all appreciated substantive conversation and this was a formula for heightening spoken language. I first heard Queen Latifah and a lot of other early Hip Hop there. We saw crazy, amazing, marginal rock and roll fanzines from Denver. David Sedaris brought in his dead cat’s ashes. It never got too showbiz, but each month the stakes would be raised, and the things that people brought in would be more and more wacky and challenging. The table was a low coffee table—you can see people’s legs, I think that’s important somehow, or at least different from sitting around a dining table—and the beverage format was the same as Invisible Seattle: half-gallon of wine, six-pack of beer. By now we could afford cheese and crackers too—the earliest evolutionary stage of social food. In Chicago in the mid-nineties I began to organize the Chicago Literary Dinners (Lit Dins), which evolved into Electronic Literature dinners. Scott Rettberg was part of that, also Joe Tabbi, whom you may know, and Kurt Heintz, a performance poet, and numerous guest stars. Other people would filter in and out. Again, super simple, just a regular night of the week where I would put out the call to gather at Moti Mahal, a wonderful Indian restaurant, and talk. But because of the regularity of it, certain traditions start to form. If you brought someone to the group, then you would be expected to give a little introduction of who they are and what they did, and kind of recommendation. It wasn’t snobby, like a screening process; it was informative. The whole business of introductions is, I think, is absolutely crucial. My favorite professor at University of California Santa Cruz was the brilliant, Cambridge-educated art historian Jasper Rose. Jasper was the only American professor I’ve ever seen who routinely sat down at lunch with students unknown to him and introduced himself. And he would introduce students to other students as well. Many student love affairs credited their first meeting to Jasper. This kind of courtly behavior was unheard of in shy and informal California. Those of us who are involved in projects where we’re trying to build community would do well to follow his example. I’m still nowhere near as socially brave as he was. The image is this: right here you have a very intelligent but very shy person who desperately wants to be a part of the group but needs a way to get past the social wall to be able to participate. So the semi-formal Chicago E-Lit Din introduction style was a nice part of that gathering. I remember Scott being particularly good at it. Also unspoken, but crucial, are the rules of the game of conversation itself. The most important rule? Making sure everyone at the table has roughly equal time to talk. We all are aware of this but we rarely talk about it, right, the meta-level of conversation? So as hosts if we found there was someone taking more than their share of time we would ask the quiet newcomers questions, draw them out. If people are rattling on—they mean well, but they may not be self-aware—sometimes for the sake of the group you have to somehow find a moment in their flow to stop them and leave a gap for someone else. There are other things that we all do in groups like these to make sure that newcomers feel included. There’s a term I love: phatic communication. It is language with no other meaning than social connectivity: “Hi,” “Nice day if it don’t rain,” plus a whole host of noises and silent gestures. “Mmm-hmm.” “Ahhh.” Nods. Eye contact. It’s like a pat on the back, a hug. We know that when we do phone interviews we have to make more noise so people know we’re listening. Phatic communication is crucial to creating a coherent group. These days I’m lucky to be in a great gang in Duluth, Minnesota. They’re a group of actors and radio journalists and writers—all great talkers. Shyness is not an issue. There’s an exquisite sense of balance. We gather at a restaurant café roughly 16:00-18:00 on Friday afternoons—a time slot that doesn’t cramp other activities. We started out working on an experimental radio show together, The Listener Happiness Program, and the happy hour group draws its name from the show’s fictional network: Imperial Quality Media. We gradually became The Imperials. When the crown goes up, as we say—we imagine it projected into the sky like the Bat Signal—the group rallies. This was the core group that in the spring of 2010 collaborated on the e-lit project Chicago Soul Exchange, and in 2011 on Grace, Wit & Charm. It’s a great group to test out the component writing games for big e-lit projects. They’re game for anything, but the e-lit projects took some explaining. As the projects got closer we moved the writing games to our living room with a half-gallon of wine and a six-pack of beer. There were blank looks at first. We wrote a little bit, read a little bit, wrote a little bit again. All of a sudden people’s eyes lit up. “This is funny! I get what’s going on here.” After that, the projects were able to move online and be really a lot of fun. But it really needed that in-person setup. So, to summarize my recommendations for building creative communities: small spaces, neurochemical balance, equal speaking time, unusual body language, loads of eye contact, fearless introductions, half-gallon of wine, six pack of beer, cheese and crackers, games. And, as I look objectively at the data in my analysis, I’m forced to recommend unemployment, because much of the work discussed here, could only have happened when people were unemployed or underemployed. You want to play. I want to. Everyone wants to. I encourage you, in settings like conferences and other group settings, to find ways to break through the social barriers, invite people in, and get into the mode of play. I know it can be uncomfortable for a moment, but that’s where the fun is. Thank you. Perec, Georges. “Lire: Esquisse Socio-Physiologique.” Penser/Classer. Paris: Hachette, 1985. Polizzotti, Mark. Revolution of the Mind: The Life of André Breton. Boston: Black Widow Press, 2009.